In this article we will talk about Redis (REmote DIctionary Server). Redis is an open source, in memory, key value store. It also referred as dictionary server as the key values are not only strings, but also hashes, sets, lists and sorted sets. Redis looks similar to memcached but has differences between them. In Memory: Redis stores the key values in primary memory for quick access of read writes. Replication: Redis supports for master slave replication. The data access can be done from slave and the writes can be performed from master. The replication provides scalability and availability. As any one of the slave gets failed, the other slave provide data access. Data Structures: Redis stores not only strings but also lists, sets, hashes and sorted sets. Virtual memory: Redis uses RAM for in memory storage. But, during the shortage of RAM it uses virtual memory to keep the data. Pub/Sub modal: Redis creates Publish and Subscribe channels where the Redis clients can subscribe to any channel to consume the data and any subscribed client to a channel can publish the data. Data Persistence: Redis persist the in memory data to file system on regular intervals. During the failure of Redis node, the data can be restored from Redis Data file. Redis has rich set of SDK support. You can find the list of client libraries here(http://redis.io/clients). There are lot of high traffic sites already using Redis. The growth the of the Redis over the years is increasing. The stats for Redis and Memcached from DB-Engines is given below. 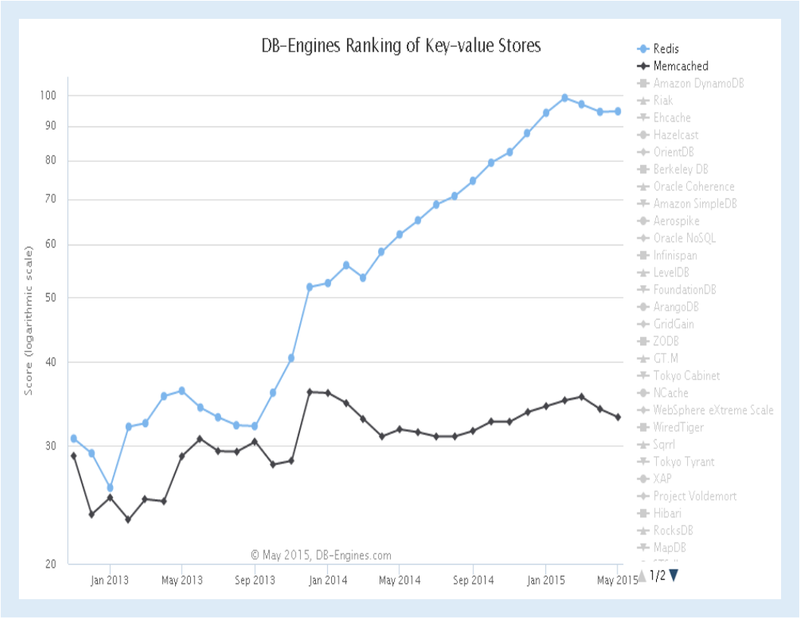 This is how DB-Engines calculate the trend. Nice comparison with memcache @Siva, even if its quite short actually! It will be shared in our next RedisWeekly (http://redisweekly.com/)!